Brighouse Town were beaten 3-2 by Tadcaster Albion in a dramatic Evo-Stik NPL match at the Yorkshire Payments Stadium this afternoon. Vill Powell’s men were two goals up in six minutes. A defensive mix-up allowed Gabby Johnson to set up Jacob Buchanan for the opener. Aaron Martin then maintained his fine scoring rate for Town with a header from a Johnson corner. 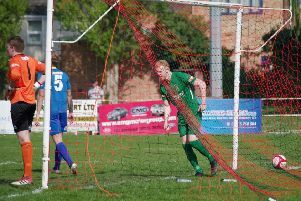 It all turned sour for Town at the start of the second half when ‘keeper Chandler Hallwood was red carded on 49 minutes. Iwan Heeley came on for Jacob Buchanan and went in goal but was beaten from the spot by Connor Sellars. Brighouse held out until the 80th minute when Aiden Savory equalised. Danny Frost got the winner 60 seconds later.